Saffron is a distinctive flavour in much Persian cuisine and has featured widely in recipes by some of the world’s most famous chefs, but its exports sank under a decade of sanctions as the west severed economic ties with Tehran. Between 80% and 90% of the world’s saffron comes from Iran, but banking and trade restrictions meant Iranian companies faced huge challenges in exporting it abroad, particularly to the US and Europe. Iranian Saffron tour is an opportunity to experience, consider taking our private Iran Saffron farmand tasting some of the main products contains Saffron like tea, Cakes and Rock candy. Southern Khorasan and its Ghaenat district produce about 90% of Iran’s saffron and barberries. We shall spend 2 days here and learn about every thing to do with saffron and barberries, from planting, to harvesting, to production and packaging. Ghaenat is a unique area of Iran and its attractions are not limited to saffron and barberries. It has an ancient history, desert architecture and functioning ancient irrigations systems. Its proximity to Afghanistan and India give it a unique geographical location. In this tour we visit saffron fields during the harvest season and join the locals in the process of picking the flowers and separating the stigmas, and learn about the traditional grinding process. Also will attend a local Khorasani musical folk performance. visit a barberry field and join the locals in the process of picking and processing barberry. We also discover the longest Qanat chain of the world and one of the most ancient irrigation system in Iran. In this tour you will visit one of the most beautiful and religiously sacred sites in Iran (The Imam Reza Shrine). After arriving in Tehran from Imam Khomeini International Airport (IKA) our representative will meet and greet you and transfer to hotel. Time permitting, tonight we go to Tehran Nature Bridge where Tehrani young couples spend time together. Time permitting, we can walk around Tehran Bazaar. As of today, there’s no bank or money exchange but the place has been delicately restored into a Dizi Sara and tea house where tea comes in thin waist cups and along with sugar canes. In the afternoon, you’ll go to see the National Museum of Iran which is an institution formed of two complexes, including the Museum of ancient Iran and Islamic Era. Tonight’s dinner in a local restaurant offers a chance to experience daily Iranian life in Tehran. 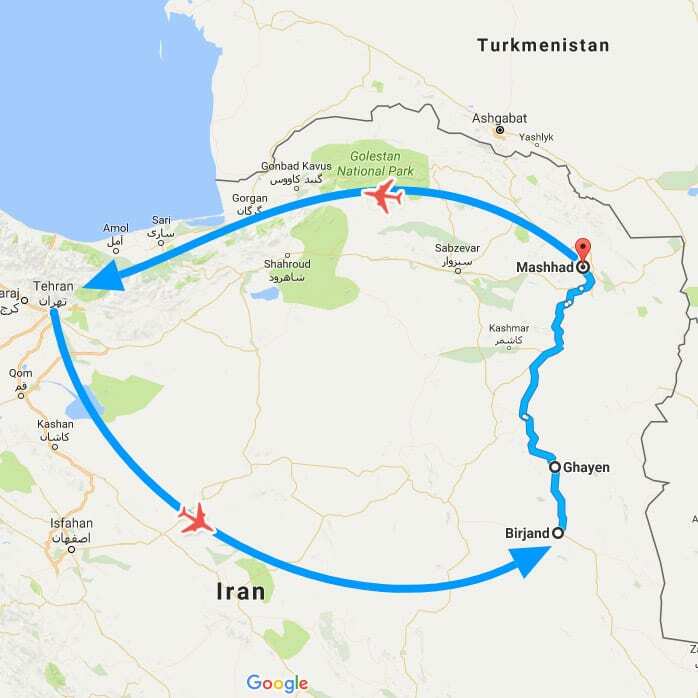 Today we fly from Tehran Mehrabad Airport to Birjand and transfer to the hotel. Full day city tour of Birjand to visit: Shokatieh School (the 3rd European School in Iran, built in 1905), Birjand Castle, a 16th Century building and The Shokatieh Gardens (A UNESCO World Heritage site). Early morning we drive from Birjand hotel to Ghaenat (1 h 24 min (107.0 km). We will be stay at an old local house, which has been turned into a guesthouse. We will be welcomed by saffron tea, fresh squeezed barberry juice and some local pastries and sweets. After a short rest and refreshment, we will drive to a barberry orchard to participate in barberry picking. Our next destination will be one the largest barberry production facility in Iran. After lunch you have an opportunity to visit the many cultural features of a desert city. Today we will wake up at 5:00 a.m to drive for a Saffron field. We will accompany the local women folk for a morning of saffron picking. You will have your breakfast in the field. It will be one of the most unforgettable breakfasts of your life: Iranian sweetened tea served with homemade cheese, fresh, hot milk, hot loaves of flat bread flavored with walnuts and garlic, mountain honey, fresh cream, butter, sesame Halva, rice halva, eggs and chamomile and finally a cup of hot local Osh will turn this cold morning into a warm memory. After breakfast, we will visit the women folk in their homes while they are separating the saffron stigma and we will see the traditional process of preparing the saffron. Then we will visit a modern, mechanized saffron processing facility. We will have lunch at a local family home. You will see the way of life, culture and hospitality of the people of this land. After a short rest, we will visit the nature of the desert and do some other sightseeing around the city. Today we will drive to Mashhad to visit the mausoleum to the eighth Imam of Shia Muslim. Mashhad is the 3rd biggest city in Iran (after Tehran and Tabriz) and is the most important religious city in Iran. The 8th Shia Muslim Imam is buried there. The Imam Reza shrine in Mashhad, Iran is a complex which contains the mausoleum of Imam Reza, the eighth Imam of Twelver Shiites. The Shrine of Imam Reza is one of the most beautiful pilgrimage sites in the world. It is the largest mosque in the world by dimension and the second largest by capacity. Then we move to visit the Tomb of Ferdowsi. Ferdowsi, the influential Persian poet and author of the Persian epic, Shahnameh died in 1020 A.D. Tomb of Ferdowsi is a tomb complex composed of a white marble base, and a decorative edifice erected in honour of this Persian poet located in Tus. Time permitting we will have a half day city tour of Mashhad to visit: return visit to Imam Reza shrine complex, Nader shah mausoleum, lunch at Shandiz village. Transfer to the airport, flight to Tehran. Transfer to hotel. The best time for this tour is from middle of October to late November. if tourist is interested it is possible to fly to another city to visit some more historical and cultural sites in Iran. Our suggestion is an additional 7 day’s itinerary to visit Shiraz, Yazd and Isfahan. If you include this program in your itinerary then your tour will be 14 nights/15 days. Contact us for more details. All nights accommodation in standard grade hotels and local houses. Land travel by A.C vehicles. Services of an Iranian tour lecturer throughout the tour. If you would like to book a place on Lut desert tour, please complete the online reservation form on our website. We will then contact you with more details about how to complete your booking. Payments may be made by making a bank transfer. Full details will be provided in your booking confirmation email. Please contact us if you would like any more information or have any questions before making a booking. Just came back from Iran and I can say that I’m really enthusiast from people and visited places. A very big thank to SURFIRAN because of their help, organization and professional way to manage everything that we need. I do suggest to visit Iran and contact SURFIRAN. they can really help you and make your life easier! Are There Any Cultural Norms In Iran?